Below is a brief catechism style bulletin insert I've prepared for our new funeral pall here at Redeemer, HB in preparation for the rite of blessing on Sunday February 10th. If you'd like a WORD file or PDF designed for a 1 sheet, 2 sided insert, simply post your email in the comments or send me an email. What is a funeral pall? 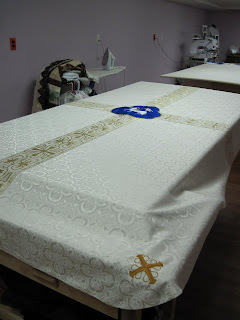 The funeral pall is a sacred parament which covers the casket at a Christian funeral. 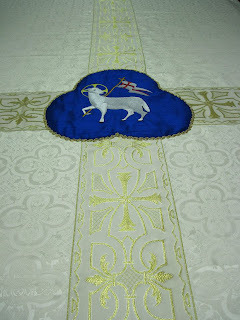 It is typically made with a combination of fine linens and embroidered Christian symbols, similar to those adorning the Altar, Lectern, and Pulpit. Sizes may vary, however, Redeemer’s new funeral pall was custom made to fit any size casket. How is the funeral pall used in the Christian funeral service? The pall is placed over the casket at the beginning of the funeral service, before processing into the nave of the church. As the casket is being covered, Romans 6:3-5 is read, proclaiming that in through Baptism we are united with Christ’s death and resurrection. The pall is then removed in the narthex at the end of the service. Why use a funeral pall in the Christian funeral service? As the casket enters the church those who mourn are reminded that we also enter Christ’s body, the Church, through Baptism where he declares us his own dear children, born again by water and the Spirit (John 3). And like all church paraments, the funeral pall adorns the service with reverence and directs the focus of worship to Christ and his gifts; it communicates the faith through a visual sermon; and above all, it points those who mourn to Jesus’ saving death and resurrection on our behalf. What do the symbols on the funeral pall indicate? The pall itself reminds us that those “who were baptized into Christ are clothed with Christ” (Galatians 3:27) and covered by His righteous garments (Isaiah 61:10). 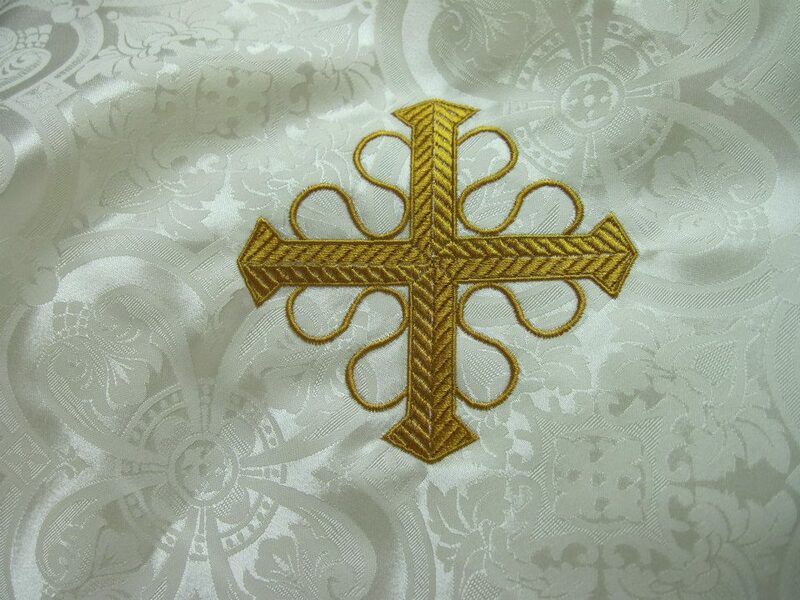 The white linen reminds us that though our sins were as scarlet, they are white as snow (Isaiah 1:18), just as the countless saints in Christ have washed their robes and made them white in the blood of the Lamb (Revelation 7:14). A golden cross spans the length and width of the pall pointing us to Christ Crucified who destroyed death by dying for us (1 Corinthians 15). Additionally, an embroidered cross marks each of its four corners. Together, these five crosses symbolize the five wounds of Christ, His hands, feet and side, for by His wounds we are healed (Isaiah 53:5). Finally, at the intersection of the cross stands the Agnus Dei, a symbol of Christ the Lamb of God who takes away the sin of the world (John 1:29). His head is adorned with a golden nimbus and he holds a victorious banner, for he reigns triumphant over death and life forever (1 Corinthians 15, Colossians 1, Revelation 5-7). 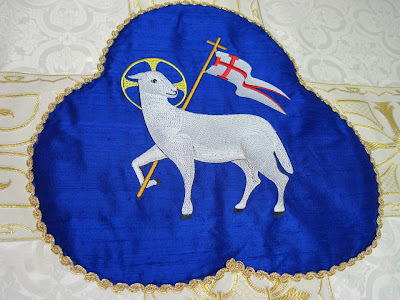 And upon the vesica, stands the Lamb arrayed by a background of blue Dupioni silk, pointing to the color of the tranquil sea before His heavenly throne (Rev. 4). These Biblical images point us to Christ’s salvation and bring the joyous light and comfort of his death and resurrection to those who dwell in the shadow of death. Special thanks to the families who made memorial gifts to the Altar Guild for the purchase of this funeral pall. Also, thank you to Dennis and Carol Gladieux of “Shepherds’ Threads LLC,” for their care and craftsmanship on this beautiful work of sacred art. Their labor of love has provided Redeemer with a funeral pall that will serve for generations to come. "Wherever Christ builds his Church, the devil builds a chapel." This often quoted Luther saying still bears true today. Each and every generation must fight for the truth, confess the saving Gospel and proclaim with Luther, "Here I stand; I can do no other." We proclaim this in the liturgy, from the altar, the pulpit, the Bible class, the fellowship hall, and in the hands of mercy. Every generation of Christians must learn anew what the Lutheran confession of faith is, what we believe and why we believe it. For every age of the Church will also have to contend with the wily ways of the old evil foe. We've seen his tricks - and the best ones are played upon God's Word, just like he did in the wilderness. The church has (and still struggles ) with the clever shell-game of the historical critical method, the siren's song of the church growth movement and its panoply of pragmatic solutions, the lunacy of liberalism in the church and its manifold and the list could go one. In the end, of course, the gates of hell cannot and will not prevail against the Church nor her Lord, the Bridegroom himself who holds the keys of the office as well as the keys to death and Hades in his crucified and risen hands. Thus for the Baptized, we are the Church, the body of Christ, built on the foundation he laid in his own body and blood; we are built on that rock, even when steeples and church theologians and hope are falling. My point here is not to offer a proper diagnosis. Others have done (and are doing) a fine job of that. Recently, Michael Horton's Christless Christianity has exposed the absolute Christological vacuum in American Evangelicalism. And Jonathan Fisk's book Broken addresses similar issues while offering orthodox doctrine and practice as the panacea. My point here is to offer another treatment, a balm and salve that has served many who have been broken by the Church, whether it was moralism, mysticism, rationalism or any other "ism." My good friend, Dr. Rod Rosenbladt has provided such a medicine for those whom he calls the "sad" and the "mad." Perhaps you've encountered folks who fit either description. I know I have. And I've handed out this little PDF booklet more times than I can remember. Another good friend of mine reads this essay several times a year. As well should we. Apologetics is also for those inside the church, for confidence and hope in what we believe and why. This was impressed upon me the moment I sat in on my first Rod Rosenbladt class at Concordia Irvine not too many years ago. Now, I never was one who was broken by the Church as his fine essay and presentation is titled. And the catechesis and church I grew up in taught me a lot. But it wasn't until I took every class Dr. Rosenbladt taught at CU Irvine, that I really began to understand what it meant to be a Lutheran and why that was a confession worth living and dying for, as we say at our confirmation. Sadly, defending the faith must also occur within the walls and membership of the Church. After all, we're sinners. This should be no surprise. Thankfully, Dr. Rosenbladt has an answer for dealing with tough questions from those who have fell prey to church membership in the devil's chapel. There are too many vicitms of fifth-column Christianity. So, here's something with which to arm yourselves, a trusty shield and weapon: The Gospel for Those Broken by the Church. Special thanks to New Reformation Press, Southern Orange County Outreach (SOCO), and Faith Lutheran Church, Capistrano Beach, CA for making this outstanding presentation of the Gospel available for free online. Below, I've embedded the video for your viewing here. And I've included the link if you want a PDF version for your own reading, church information cart, or to hand to a friend who has been broken by the church. And make sure to take the time to visit the website of New Reformation Press. You'll find a host of resources for use in declaring and defending the faith once and for all delivered to the saints (Jude 3). To go to the website for New Reformation Press , click here. To access the PDF of The Gospel for Those Broken by the Church, click here. To access the video from Faith Lutheran Church's Vimeo page, click here. The following outline forms the basic structure / outline I used for a presentation at Redeemer's recent "Family Preschool Night." The motivation behind this event is three-fold: 1) Encourage and educate families on how to spend time together with activities such as games, cooking, playtime, etc. by means of doing the "hands-on" activities together in the same room, 2) Supporting families in our church, preschool, and community by being a safe haven where families can come and know they are cared for in our midst and receive resources for both the physical and spiritual nurturing of their family, and 3) Catechesis on aspects of Christian faith and life that can be used in the church and at home with family devotions. 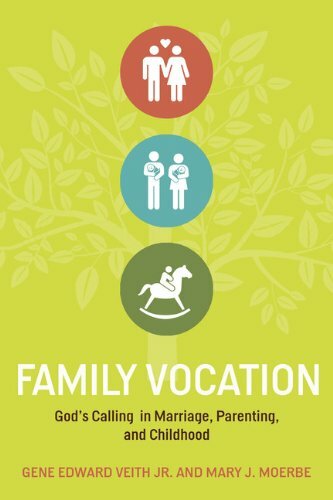 This year I chose to use "Family Vocation" by Mary Moerbe and Gene Veith as the basis for our study together. Having read the book, written a brief review in the past, and now used it for a study with families, I am encouraged each time I go back to the book. Below, I've posted the brief outline I used for our discussion and reflection time together last Thursday evening. Feel free and use it if you find it a helpful resource. And if you haven't picked up this book yet, do it today. You won't regret it. – Martin Luther, Large Catechism, 4th Commandment. I. Vocation and family – begins and continues as gift and gift giving from the Gift Giver, Christ. II. Vocation – God’s Masks, God’s Means, God’s Mercy. 1 Corinthians 7:17. III. Christian life is divided into three “realms” or “estates”: Home, Church, and Government. IV. God created us to be in relationship / family – Genesis 1-3. V. Family is the most basic and essential vocation in culture / society. VI. Family is a “holy order” – built and given by God’s authority for our well being. VII. A different kind of book for a challenging day such as ours - Family Vocation: Marriage, Parenting and Childhood. VIII. 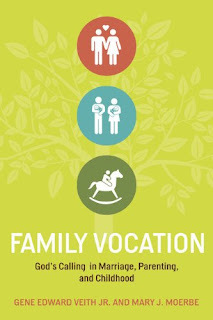 The key to thriving families and family renewal is the doctrine of Vocation. IX. The key to the doctrine of vocation is justification - that we are saved by grace through faith in Christ’s free forgiveness won for us by his death on the cross. Matthew 20:28. 1 John 4:10-11. Romans 5. Hebrews 7. John 3. UNWRAPPED Sectional Presentation: Lions and Witches and Skeptics, Oh My!